It was another wonderful session of thanks giving and an expression of gratitude for Esama of Benin Kingdom, Sir (Chief) Gabriel Osawaru Igbinedion when he celebrated his 82nd Birthday in the ancient City of Benin, Edo State. 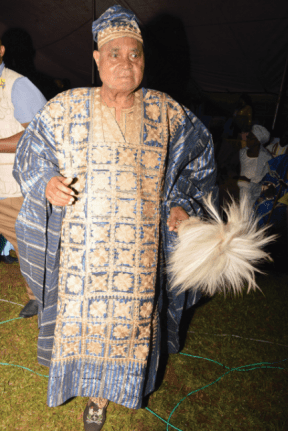 The family had referred to the Patriarch of the House of Igbinedion as an oak and a legendary octogenarian, and there is no gainsaying the fact that he had stood the test of time, touched many lives and put smiles on many faces. In a write-up in the official birthday programme, Mr. Michael Edo-Ogie, Historian to the House of Igbinedion began by briefly presenting a poem about the famous Oak Tree by Johnny Ray Ryder Jnr “A mighty wind blew night and day. It stole the Oak Tree’s leaves away”. Part of me. Until today. I wasn’t sure of just how much I could endure. And he continued “Just as the Oak Tree is unlike any other tree in it’s habitat, so is Chief Igbinedion different from any other person around him (humility, wealth, pedigree and power not withstanding).The oak tree is universally acknowledged as a symbol of strength, endurance and longevity. Born in the year 1934 in the obscure farming community of Okada (now the University-town and headquarters of Ovia North East Local Government, Edo State of Nigeria) to the late Road Overseer and iconic community leader, Josiah Agharagbon Igbinedion (who founded Okada Town and his amiable wife, the late Madam Okunoze Igbinedion of the famous Ihaza Chieftaincy Family of Usen, Ovia South West LGA in Edo State), the little boy who was named Gabriel Osawaru rose from those humble beginning to the giant of man, an internationally-recognized businessman that he has become. His 82nd birthday celebrations tagged “Igbinedion the great – Celebrating the Abundance of God’s Grace’’ began with a Morning Dew Service at the Palatial Igbinedion Mansion, Benin City with the famous hymn,“Blessed Assurance” followed by an opening prayer, by Rev. Dr. Omo Okundaye. As has been the norm for decades, the week-long celebrations began with courtesy visits but hit a high tempo with his birthday thanksgiving which was an inter-denominational service and was attended by Men of God from far and wide. That was not all, an evidence of his immense impact on the lives of people was the fact that hundreds gathered at his palatial home very early that morning to honour the Great Esama. Apart from prayers from the men of God present, there was a session of praise and worship by various Church choirs. It was really soul-lifting and spiritually stimulating. It was the President of the Pentecostal Fellowship of Nigeria (PFN), Dr. Felis Omobude that delivered the sermon. Where he praised the celebrant for his love for God and his penchant for always putting God first in his life. Dr. Omobude stated “Riches and wealth is a gift from God. As you woke up this morning, you took your bath and you are well dressed. It is a blessing from God because there are many far younger than you who cannot lift their bodies when they are awake. Chief Igbinedion, I salute you. You are indeed a great man. The book of Isaiah says, ‘but they that wait upon the Lord shall renew their strength; they shall mount up with wings as eagles; they shall run, and not be weary; and they shall walk, and not faint’,” This has been your story, and the Lord will continue to bless you”. The sermon over, the celebrant and family were then invited to the front of the arena where they were showered with prayers by all the men of God present. There were some goodwill messages before the celebrant’s eldest son, former Governor of Edo State, Chief Lucky Nosakhare Igbinedion delivered a very warm thank you speech on behalf of the House of Igbinedion. The service was formally brought to an end by Pastor Osarenren Ighiwi who delivered the closing prayers. Later, Chief Igbinedion, his lovely wife, Lady Cherry Igbinedion, surrounded by their close family and friends cut his 82nd birthday cake to the glory of God. Of course, as usual, Chief Igbinedion was at his hospitable best, guests had lots to eat and drink, there was good quality musical entertainment and without any doubt, everyone had a very wonderful time.